If you have a good idea for a book or a screenplay, why aren’t you writing it (or, if you’ve started, why aren’t you finishing it)? Are you letting your writing dream slip away day by day, month by month, year by year, waiting for the right time? Yes, this is the right time to start, and I want to help you overcome all the things standing in your way. Things like not having enough time, not having a writing space, not feeling supported by the people around you, or worrying that what you write won’t be good enough. Imagine how much easier writing is going to be with that kind of help-and how proud you will be when you finish your book or your screenplay! I’ve written nine books (including “Your Writing Coach,” and “Creativity Now! ), more than 100 produced episodes of TV series, half a dozen TV movies, a miniseries starring Rob Lowe (“Midnight Man”), a feature film starring Kelsey Grammer (“The Real Howard Spitz”) and plays produced in New York, London, Los Angeles and Berlin. I’ve also been a writing teacher for more than 20 years. I know the real-world obstacles to writing–and how to overcome them. I want to share that information with you. As you see from the covers to the right, I’ve written additional books that can help you realize your writing dream. You can get all of them from Amazon or your other favorite bookseller. Your Creative Writing Masterclass collects the greatest advice about writing from classic and modern authors including Austen, Poe, Stevenson, Fitzgerald, Hemingway, Amis and many, many more. Creativity Now is full of practical tips for getting into a creative mindset, generating ideas, and turning ideas into action, as well as case studies of how other creative people achieved success in a variety of fields. Focus: use the power of targeted thinking to get more done gives you innovative strategies for setting and achieving goals, using your time wisely, and mastering your to-do list. It was a W. H. Smith business book of the month, sold more than 25,000 copies in the first six months, and has been translated into more than a dozen languages. Marketing for Entrepreneurs helps creative people to come up with a strategy for marketing what they create. It includes a fill-in-the-blanks format for generating an entire plan. Do Something Different features 100 case studies of people who found innovative, inexpensive ways to market what they created. The examples come from many different fields and can be adapted to whatever you want to market. The book features a foreword by Sir Richard Branson. For tips on writing and creativity, see http://www.TimeToWrite.com and if you’re interested in screenwriting, see http://ScreenwritingSuccess.com. 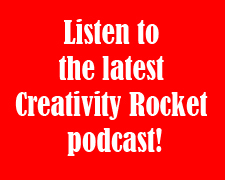 Welcome to the very first Creative Breakthrough Podcast! My guest is Janice Day (pictured), author of “Getting It Off My Chest,” the funny and touching story of how a huge challenge (breast cancer) became the vehicle for the transformation of her life. She talks about the various approaches to memoir writing that she tried, which one finally worked (and why), how to find your voice, dealing with agents and publishers and more. I also tell the story of how therapist Milton Erickson dealt with a patient who thought he was Jesus Christ, and how Erickson’s approach can help you be a better writer. As will be customary, my faithful manservant Arthur co-hosts. [Audio clip: view full post to listen] Jurgen interviews creativity expert Nellie Jacobs about what the most creative people have in common. As usual, Arthur, Jurgen’s faithful manservant, helps out. [Audio clip: view full post to listen] Jurgen interviews storyteller Matthew Friday about the power of story and what every story should include. As usual, Arthur, Jurgen’s faithful manservant, helps out.